Disney Research and Scott Hudson of Carnegie Mellon’s Human-Computer Interaction Institute have developed a way to 3D print with wool. While most 3D printers use layers of plastic to print objects, the device that Disney is developing is a hybrid between a standard 3D printer and sewing machine, and is capable of 3D printing teddy bears in yarn, layer by layer. According to Scott Hudson, the completed results look like they could have been knitted by hand. The printing process isn’t limited to just bears. Hudson says that with the expansion of materials becoming available to 3D printers, new possibilities are opening up. The unique 3D printing process could eventually be extended to products such as clothing, hats, and scarfs. 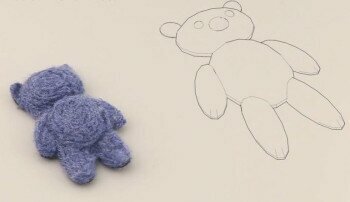 Hudson also tried creating movable arms for the 3D printed teddy bears by using plastics pieces embedded with nylon – the result was a prototype of what could be the next step. He adds that this is “only a beginning” and that more time is needed to perfect the project. The process still needs to be perfected and this technique still requires assembly of objects since the printer only produces fabric objects, but Hudson says that it should be possible to design a printer that could produce both fabric and plastic elements in a single fabrication.